For seven years Dila Bayramov has lived in this beautiful apartment located in Jerusalem. With her home just a little over 500 square feet, Dila has been able to pack into every corner meaningful pieces that have been collected over time, sourced from local flea markets and that were passed down to her by her grandmother. Her grandmother was much the source of her design inspiration. Dila had lived with her in Caucasus for several years, surrounded by antique rugs and cozy textiles. And it's easy to see her grandmother's impact on her own style which embraces rich tapestries, rugs and lots and lots of colorful elements. For Dila, everything in her home has a significance to it. Items have been sourced from places near and far. In her own shop, Delirium Decor, Dila sells a curated collection of vintage textiles and artisanal goods. It's clear that this home decor maven has a love for found objects. A vintage Tekke Kapunuk above the bed was found on Ebay. The piece was originally decoration to frame the door way of a yurt from the Tekke, a Turkoman tribe. Her home itself feels beautifully curated. Small accents like these golden planters on the window sill look as if they have a story to them. They are likely finds that this design-lover has found on some of her favorite sourcing trips, strolling around the Old City bazaar in Jerusalem. An experience she likens to entering Aladdin's Cave. It shows that Dila grew up around vintage pieces and absolutely loves being surrounded by them. In every room in this home vintage rugs can be spotted, adding both color and pattern to the space. An antique rug gifted by her grandmother is something she describes as one of her favorite heirloom pieces in her home. The rug, rich in symbols and warm colors is a reminder of her childhood home. In the interior's light-filled living room a mix of vintage furnishings comes together to create a warm environment. A gray statement wall adds color to the space. On the floor, a multitude of vintage rugs keeps things warm and inviting. Everything is lovingly placed to encourage togetherness and conversation amongst guests. The sofa features a range of beautiful pillows featuring textiles from all around the globe. Pieces from the collection can likely be spotted in Dila's shop where she has Hmong pillows, mudcloth pieces and hand-dyed indigo textiles. Indigo elements can be spotted on the sofa and on small stools that surround the mid-century coffee table. Having a way with blending textiles from a multitude of different nations is a gift. In every nook in this home you can discover beautiful pieces that have a story to them. Here, an antique Caucasian rug has found new life as a lumbar pillow perched in a bedroom vignette. Another rug from her collection takes residence in a side chair in the living area. 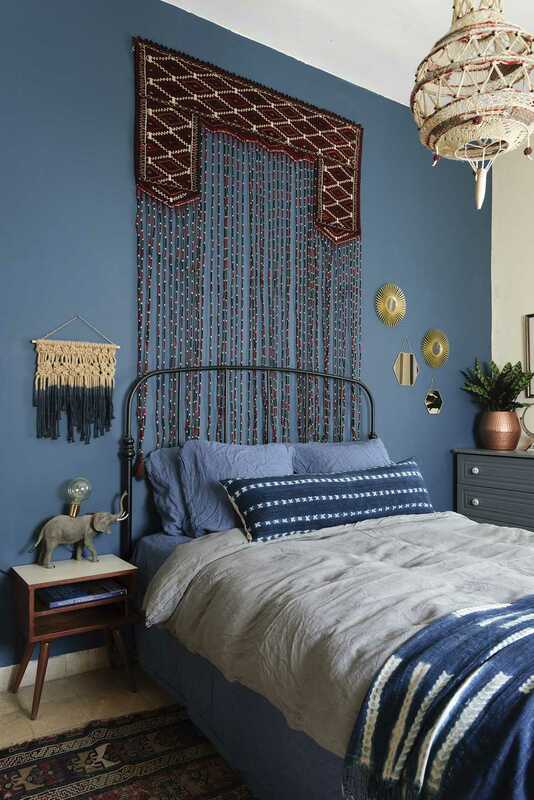 The mix of mid-century modern pieces and antique textiles is a perfect combination. The crafted lines of mid-century furnishings, and the artisanship of textiles with centuries-old histories relate to each other. And with a refined color palette, the pieces come together effortlessly in the living area of Dila's home. A vintage chest is another stunning piece in the living room. Dila lists Ebay as her go-to resource for unique pieces for the home, calling it the center of vintage finds and treasures. With five dresser drawers and stunning hardwood, her eye for finding beautiful pieces with a history to them really shines in her home. The dresser is topped with a handmade basket and sculptural table lamp. A love of family, of where she has grown up, of the places that have meaning to her. These are the things that make up Dila's beautiful home in Israel. Vintage pieces picked up in flea markets and on Ebay have been beautifully curated to create a space that feels like home. In the kitchen is one more moment of collected pieces. A selection of cutting boards and ladles hung as an artistic display. An homage to this home decor enthusiasts love of meaningful pieces.